Alisa Valdes-Rodriquez’s DIRTY GIRLS ON TOP was selected as one of the top novels of 2008 by AfterEllen.com. Alisa is also pleased to advise that registration for this year’s ChicaLit Club conference is live online. For more information on the ChicaLit Club, please click here or visit chicalitclub.blogspot.com! Jennifer Prado is pleased to announce that the content of her blog, Emerge – New Authors, which features new and established authors will be reprinted on a weekly basis by a popular Arts and Culture website beginning in January 2009. Mary Castillo will be moderating a panel on Sunday, January 25th, 3-5 p.m. at the Los Alamitos-Rossmoor Public Library. The panel includes Jamie Martinez Wood, Reyna Grande, Margo Candela, Sandra Lopez and Sarah Garcia. The library is located at 12700 Montecito Rd in Seal Beach, CA 90740. For more info, please call (562) 430-1048 or visit www.marycastillo.com. Berta Platas has a fun new widget for her LUCKY CHICA release! Click here to see what you would do if you won $600 million dollars and to read an excerpt from Berta’s new book. 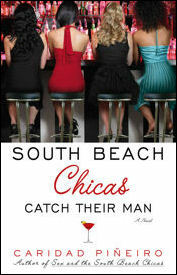 Caridad Pineiro’s SOUTH BEACH CHICAS CATCH THEIR MAN has been chosen as a Joyfully Reviewed Recommended Read for December. To read the review, please click here!